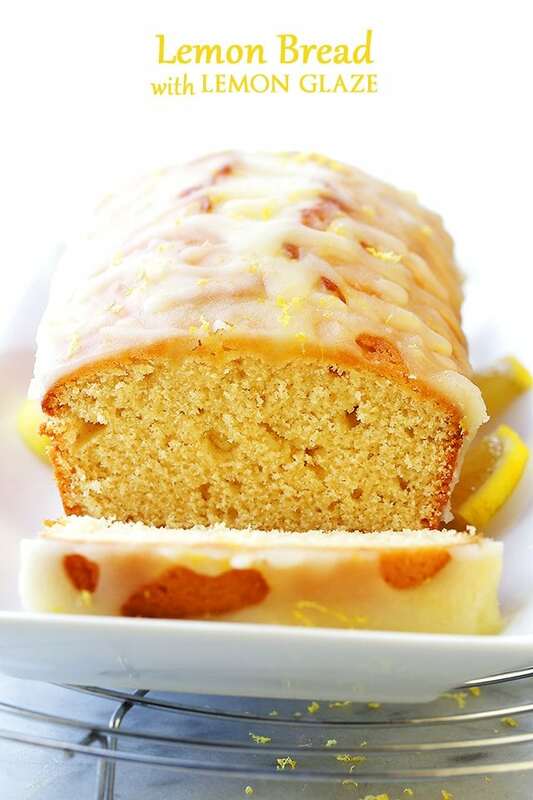 Lemon Bread Recipe – Packed with lemon flavor, this easy to make quick bread is sweet, crumbly, lightened-up, and incredibly flavorful! The Lemon Glaze takes it over the top! My face just puckered up! Yours, too? Blame it on the lemony lemons! I sound like the channel 5 weather report, but you’d be just as excited if you also experienced the 3 days of Snowzilla. Also, side note, every single darn, “Mom, I’m boooooored!! !” and “Mom, I hate my sisterrrrr!! !”, was punished with both of my girls sitting on the couch and holding hands while listening to MY playlists. Day.Made. Also, second side note, we ate two loaves of this Lemon Bread throughout the entire 3 day ordeal. My Ana, which is like the kid that thinks french fries and mac ‘n cheese are the only food groups, ate 3 slices and called Grandma to tell her about how good it was. So that says somethin’, you know? But yeah. I’m SO on the lemon bandwagon right now. I made Lemon Biscotti two weeks ago, and Lemon Cookies last night. Target had lemons on sale and that was the perfect excuse for me to go there and stock up on some new things I will barely need. Like, say, a new scarf, some spring boots (what the heck is “spring” boots?! ), and a few pastel bowls and plates because I *might* use them. At some point, I found the produce aisle and bought three 2-pound bags of lemons. Wait. Look at this! Don’t you just want to take a bite?! Did you pucker up again? Ooooh but. 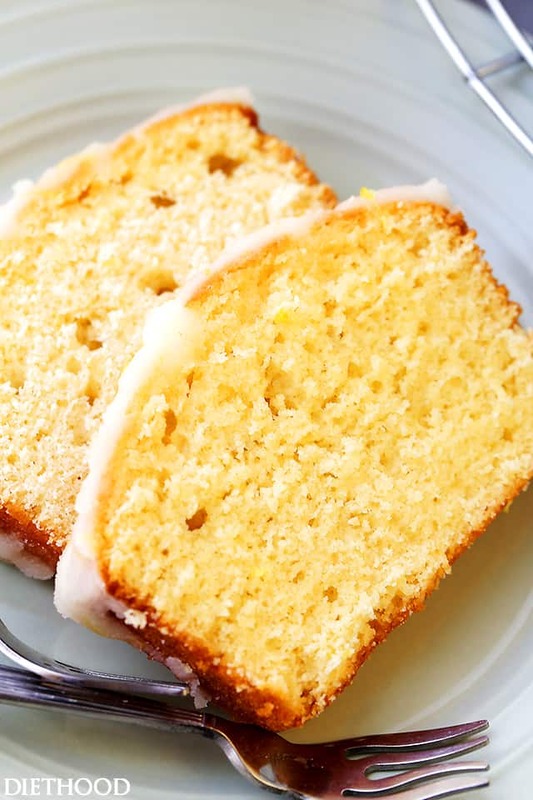 It’s lemon glaze – over lemon bread! Uh. Hello heaven. I could probably eat this, face first, without my hands. Wild child. Here’s the good news. There’s 193 calories per slice here. That’s not bad, boo! You could have two slices with a cup of tea or coffee and call it a hearty breakfast! OH OH! Third side note! Brilliant idea: This should be on your Easter Brunch menu! I’d make two loaves for that, just to be on the safe side. And, as you may know, I try to lighten-up desserts as much as I can, so here I used some soy milk instead of whole milk, and Ultragrain All-Purpose Flour for a bit of whole grain in our cake. bread. loaf? whatev. 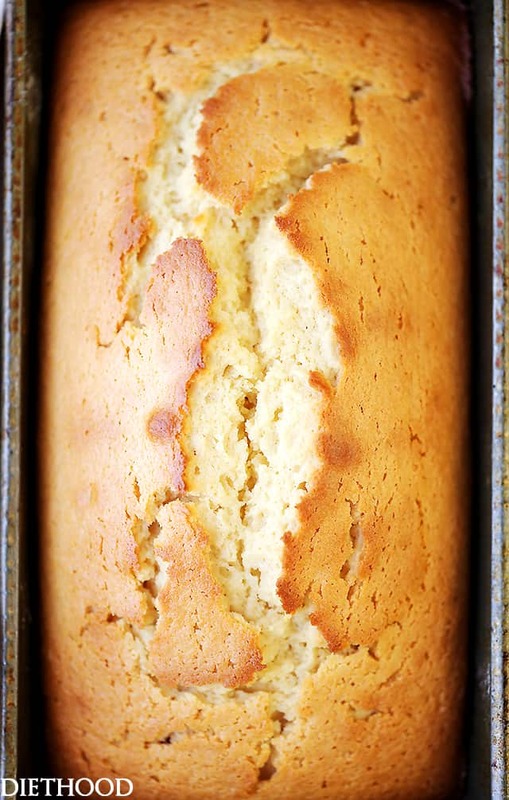 But you know this and I won’t bore you, other to say that this Lemon Bread is easy. The only thing is that it’s slightly time consuming but it’s time spent sitting around while waiting for it to completely cool. I like to make it the night before and then glaze it the next morning, right before breakfast. 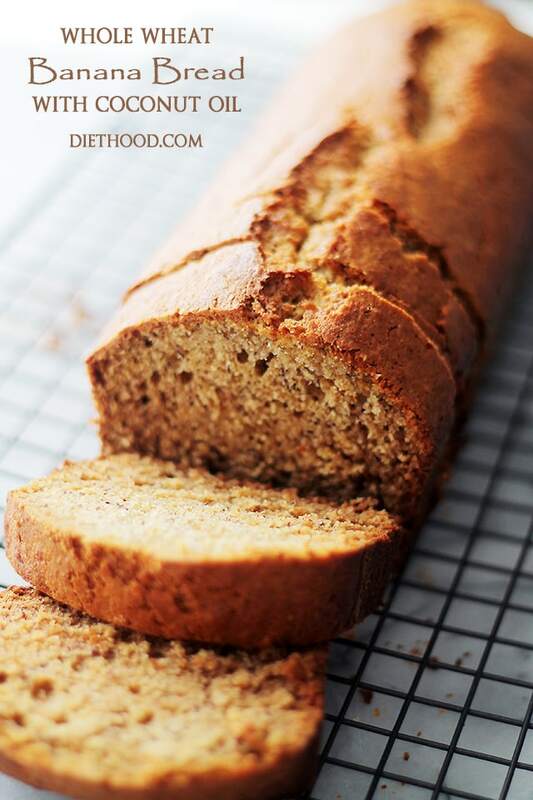 Packed with lemon flavor, this easy to make quick bread is sweet, crumbly, lightened-up, and incredibly flavorful! 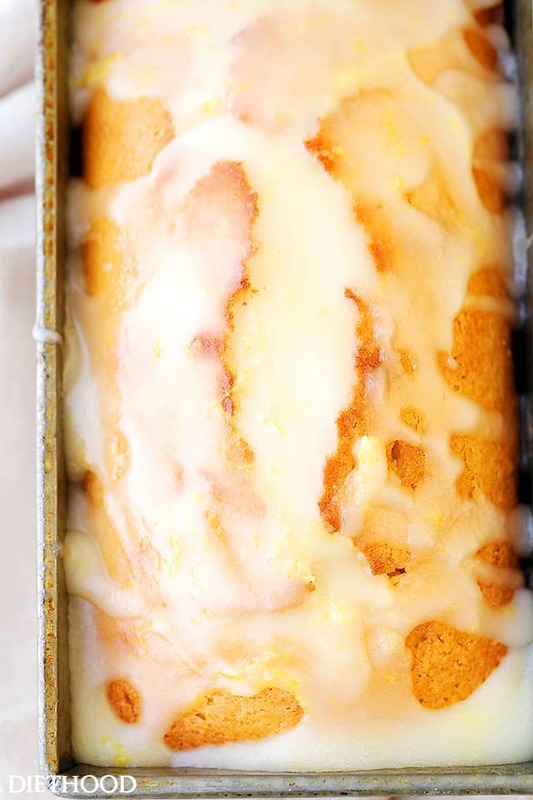 The Lemon Glaze takes it over the top! Grease and flour a 9x5 loaf pan with cooking spray and set aside. In a mixing bowl, combine flour, baking powder, and salt; whisk well to combine. Set aside. In your mixer's bowl, combine butter and sugar; beat until the entire texture is smooth and creamy, about 2 to 3 minutes. Add lemon juice and lemon zest and continue to beat until just combined. Pour batter into previously prepared loaf pan. Bake for 50 to 60 minutes, or until a toothpick inserted in the center of the loaf comes out clean. Remove from oven and cool on wire rack for 15 minutes; run knife around edge of bread and slowly remove from pan. Transfer bread to wire rack to cool completely. 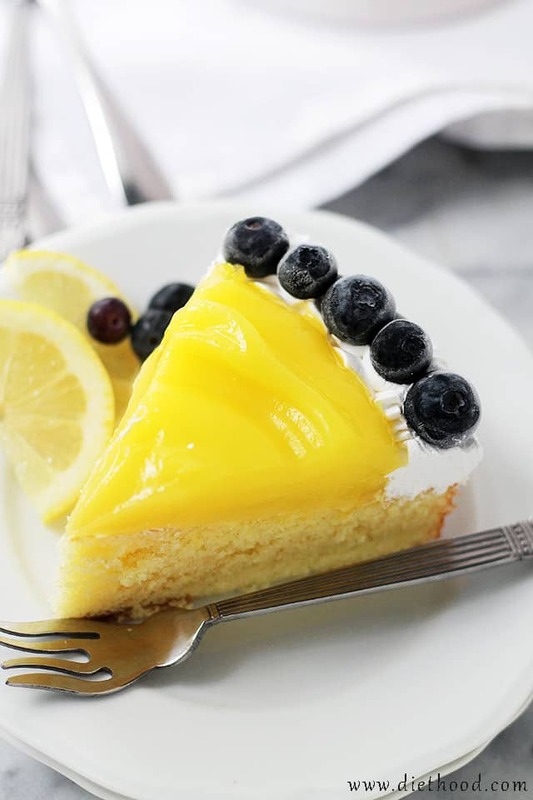 Place all the ingredients for the Lemon Glaze in a small saucepan and cook over medium-heat, whisking constantly just until warm and combined and no lumps appear. Remove from heat and let stand 1 minute. 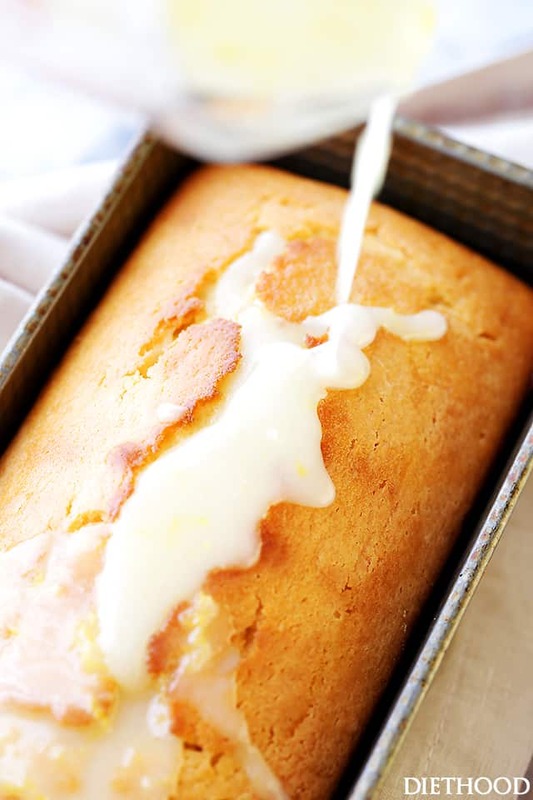 Put the Lemon Bread on a wire rack placed over a baking sheet or foil. Pour the Lemon Glaze over the bread and let stand a couple of minutes before cutting. Can whole wheat flour be used instead of all purpose flour? Hi Robin! You can use whole wheat flour, but use only half because, it’s hard to make a 100% whole grain bread that doesn’t end up dense and heavy. That’s why it’s always suggested to mix in all-purpose flour with your whole grain flour. I always use the 50/50 approach. I hope that helps. I tried this out this morning for Easter, but my bread didn’t rise at all. The only change I made to the recipe was using almond milk because that’s what I had on hand. I also used splenda instead of sugar, but I wouldn’t think that would make any difference, so I’m not sure what happened! Hi Lacey! So the bread just stayed flat in the pan? The almond milk sub is perfectly okay. I don’t know what could have happened. 🙁 Did you use the baking powder and eggs? Did you by chance open up the oven door a few times? That can also result in a flat cake or bread. How about mixing? Did you use an electric mixer? I’m trying to go through all the maybe’s… let me know, if you have a chance. Thank you!! Have a Happy Easter! I did everything else by the recipe and I didn’t open the oven door at all. I used a Kitchenaid mixer for everything. The only thing that didn’t go as well as I wanted was whipping the butter and sugar together. It didn’t quite get to a creamy consistency. The bread was maybe a little more than an inch thick when I took it out. It tastes fine with the glaze though – just a little dense, so it wasn’t a huge mess up or anything. I’ll definitely try it again sometime soon because I love everything lemon this time of year! neighbors trees are full of lemons – so guess what I am making. did you ever try it in the small loaf pans (to give as gifts) would there be different instructions. Haven’t seen any news from you lately – been busy?? I do have those mini loaf pans, but I have never used them! And I didn’t even remember I had them until you just mentioned it. 😀 I would suggest baking for about 25 minutes before you start checking the center with a toothpick. I know for most mini loaves it takes about 30 minutes to bake, so this should work. Let me know if you try it! Not the lemon bread -but I must comment on the Turkey Swedish Meatballs recipe. I AM SORRY-it is not a favorite. Family did not like it either. What went wrong. Meatballs were VERY dry.and not enough sauce. it made 16 2″ balls. I added lots more cream cheese but still not enough sauce. would have been better with Cream of mushroom soup. I have made so many of yur recipes and all great. This one justdid not work for us. Oh no! 🙁 Sorry to hear that, Janet. I’ll see to fix it as soon as I get a chance to make it again and see if I missed something when writing out the recipe. This looks delicious! Makes me want to dive on my screen right now and grab a slice! YUMMY!! This bread looks amazing!! I love anything lemon and I could drink that glaze by the glass. Yum! How pretty is this bread, and that glaze is beyond! 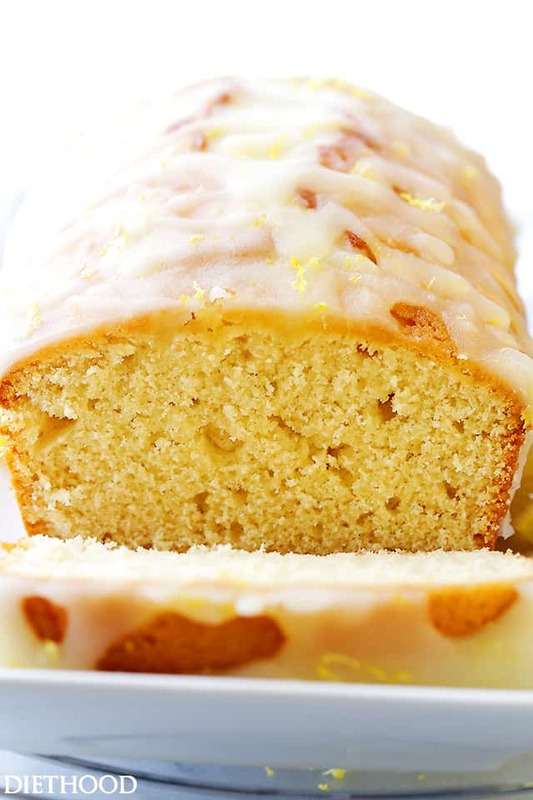 This lemon bread looks amazing. The pictures alone make me want a bite. Pretty, pretty bread. I always enjoy a sunny, lemon bread especially during the cold gray winter. I thought I was torturing myself enough by updating my old lemon bar recipe and now I have to look at this MAJESTIC bread?!?! Life is not fair! Lemon is the BEST antidote to snowmageddon! I start craving lemon like mad this time of year. I’ve got a bag full of meyers sitting on my counter and i’m trying to decide what to do with them. This bread looks amazing!! Love anything lemon, looks luscious!!Thanks! Pinned and printed! Oh, yes! This bread needs to happen in my kitchen! 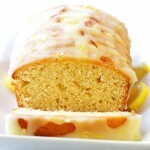 LOVE a good lemon loaf! Can this bread be made with whole milk?